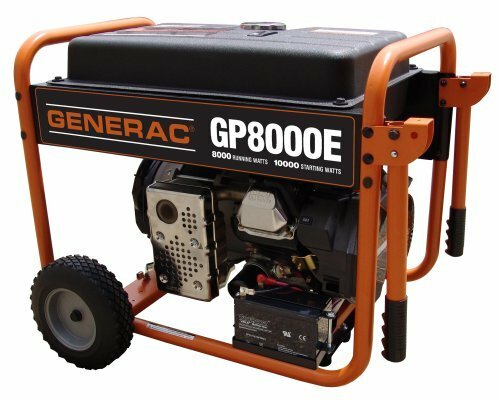 Generac GP8000E Portable Generator is easy to use in a variety of applications and offers affordable reliability. The Generac 420cc OHV engine has electric start and includes the required battery. 7.5 gallon steel fuel tank with fuel gauge gives you 9.5 hours run time at 1/2 load. Hardened steel tube cradle with folding, lockable handles and 9.5in. solid wheels for easy portability.